There are many Thrissur attractions in the cultural capital of Kerala, Thrissur as earlier known as Trichur. They are natural attractions as well as man made attractions. 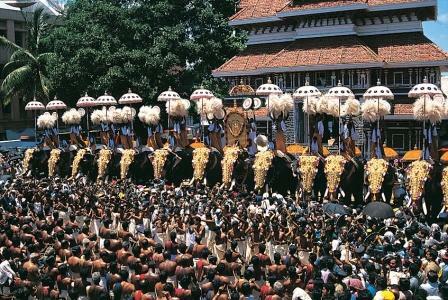 Thrissur Pooram is a spectacular temple festival, held in April-May. This festival is conducted at the sprawling Thekkinkadi Maidan, encircling theVadakumnathan temple, in the heart of Trichur city. This festival is also the mother of all poorams. The main attractions of this festival are the processions of the richly caparisoned elephants , exchange of parasols, hours-long fireworks, and the magical effect of panchavadyam. Town hall An Art Gallery is here with mural paintings from all over Kerala. Zoo Located just 2 kms from the town, this zoo houses many different types of animals. Archeological Museum Located on the Town Hall Road, this museum is open from 10 a.m. to 5 p.m. on all days except on Mondays and National Holidays. Art Museum Located in the Zoo compound, this museum displays collections of metal sculptures, woodcarvings and ancient jewellery. Guruvayur Temple : Sri Krishna Temple at Guruvayur, also known as Guruvayur temple, is very famous for Hindus, located about 30 kms from Trichur railway station. It is one of the most sacred and important pilgrim centres of Kerala,and a major Thrissur attraction. There is a tall (33.5 m high) gold-plated pillar of lamps in the outer enclosure, whose thirteen circular receptacles provide a truly gorgeous spectacle when lit. Only Hindus are allowed inside the temple. Guruvayur temple is also known as Bhooloka vaikunta. Luxury Hotels and Budget hotels are available there. Other famous temples like Vadakkumnatha temple, Paramekavu temple, Thiruvambadi Krishna Temple, Triprayar Sri Rama Temple, Koodalmanickyam temple, are also here. Punnathur Kotta – Situated very close to Guruvayur Temple, you can see herds of elephants, numbering more than 40, housing at their home. It is also known as Anakotta. Chavakkad Beach : Chavakkad Beach is situated just 5 kms away from Guruvayur. It is a sea shore for rare scenic beauty. Unaltered by modernisation and laced on the borders by an array of coconut palms. Chettuva Backwater – From Chavakkad beach, the distance is just 6 kms to Chettuva Backwater, at Chettuva village. This popular destination is dotted with mangrove vegetation and islets. From Trichur the distance is about 32 kms. A journey in the houseboat is a cherishing memory. Soochippara waterfalls Located about 22 kms away from Trichur. Athirapally Waterfalls : Located 63 kms away from Thrissur, Athirapally Waterfall is a most visited picnic spots in Kerala. Peechi Vazhani Wildlife Sanctuary: It is one of the important wildlife sanctuaries of Kerala and is situated 23 kms away. Kerala Kalamandalam: This is a leading training school for Kathakali dance drama and other arts like Mohiniyattam, Koodiyattam and Ottam Thullal. It is located at Cheruthuruthi, 29 kms away from Trichur, on the banks of Bharathapuzha. Peechi Dam: Located 20 kms away from Trichur, Peechi Dam offers boating facilities. By Air: The nearest Airport is Kochi (Cochin). By Rail: Trichur has a Railway Station. By Road: Trichur is well connected by road.